Although living separately in time and place, from the global point of view we are all living together. We can talk about higher matters and philosophies and the end of the world. We can be silent and blind. We can try and blame someone for our mistakes. The possibilities are many, but reality is as it is. Latvia is most beautiful place (for us), but it is not a large country. Riga is not the largest city. Our city parks are very small territories, but they are a part of our planet. Our aim is to commence series of action to effect a positive change in our land. Surely, it is somewhat naive to think that the youth will suddenly change their attitude towards themselves and regard their backyard, or a piece of forest as a small part of their world. However, it is possible that many may develop a real love for the environment. A person who loves something is not going to hurt it…or others. We will endeavour to maintain the idea and idealism of human values. Obviously, this cannot be achieved with a few worker-bees or informative booklets. Yet, we can begin to gradually cultivate a new attitude towards the need for a clean environment and accept the responsibility for our actions. The Project FOOTPRINTS originated in May of 2002 when after several unsuccessful waste-collection bees their manager Vita Jaunzeme came to a conclusion that the little green men did not create garbage and garbage itself was not the cause. Most probably, a human being is in the centre of the whole problem. All around the world the scope and speed of the mankind's produced waste is increasing catastrophically and it will not slow down. If we suppose that a person on the Earth produces 3 litres of waste each day, and if we suppose that 18 billion people inhabit it, and if we suppose that a year consists of 366 days, and if we consider that chemical substances that flow into waters, fumes that evaporate in the air and other civilisation products will not disappear somewhere and sometimes, and if we suppose that the world will not end in a year's time, then… we have to start thinking what shall we do with this Planet if it is totally littered, utilised, poisoned and sterilized. Therefore work and activities for people - each individually and all together - could deal with the result of negligence, laziness and greediness and solve the problem of all-embracing garbage in parks and forests. This could be achieved using various methods: drilling and imposing various types of penalties. One can try bringing up and educating. Both methods are rather good as the result is the same. While the aspect of upbringing is more civilized and it works longer. Therefore the PROJECT FOOTPRINTS is an environmental and educational project and its main objective is to achieve a turning point of attitude towards oneself and the surroundings, in the broad sense - this PLANET. Each waste-collection bee starts with the sentence: "Today we will tidy up a small part of the Planet!" By tidying up the surroundings we can set ourselves right. By setting ourselves right we can tidy up the surroundings. The beauty exists in harmony and love. Let's be beautiful, let's be wise, and love our dear ones, our land and us. 44 Latvian Olympians took part in the Project. 39 territories in Riga have been cleaned and tidied up. 1180m3 of household waste has been removed. 4000 students and pupils from 17 higher educational establishments and 21 schools throughout Latvia participated in the Project. The World Olympians Association understands the need to conserve our natural resources and protect the environment on our planet. In doing so the WOA recognizes the excellent efforts being made through the "Footprints" program in Latvia. Together with Olympians everywhere we vow to help improve this place we call home. The good work in Riga serves to motivate everyone to carry the flame high in knowing that Olympians are working for a better tomorrow. The Project has been presented in conferences and seminars related to environment and sports in Vilnius (Lithuania), Budapest (Hungary), Torino (Italy). Dr. Liston D. Bochette, Secretary General of the World Olympians Association arrived in Riga in 2003 with an aim to get introduced with this project (the Project Footprints). Dr. Linston D. Bochette and the work group of the Project Footprints in the hotel "Park Hotel Ridzene" in 2003. We would like to thank the hotel for support and the wonderful reception! Olympic Solidarity - International Olympic Committee has granted USD 10 000 to shoot a documentary on the activities of the Project Footprints. Director: Vija Beinerte. 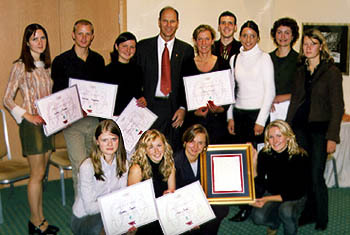 In 2002 the Project Footprints received an award of the Riga City Council and letters of recognition from the Ministry of Environment and the Ministry of Education and Science of the Republic of Latvia.